Some of the earliest nautical views Alaska, Mexico and South America ever published. Vues de Quelques Caps et Iles de la Cote du Nord Ouest et des Cotes Du Sud-Ouest et due Sud de L'Amerique. A fine example of George Vancouver's 1799 view sheet depicting various capes explored by Vancouver and his officers during this historic exploration of the western coast of America. 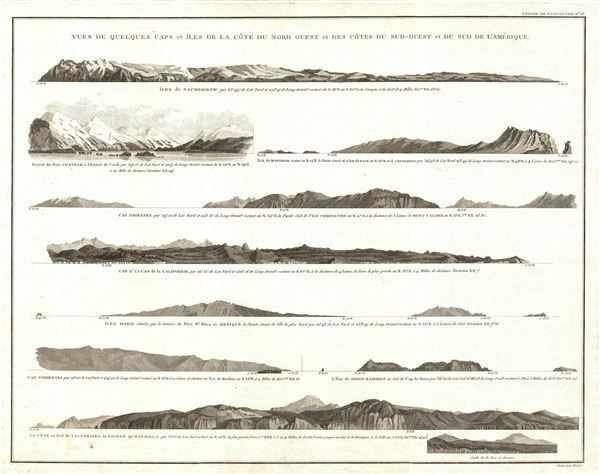 This sheet features nine beautifully rendered views detailing, from top: Tscherikow Island, Alaska (Chirikof Island); Port Chatham, Alaska; Wingham Island, Alaska; Port Alexander, Alaska (Cap Ommaney); Cabo St. Lucas, Mexico (Cap St. Lucas de la Californie); the Mary Islands, Mexico (Islas Marias or Iles Marie); Cabo Corrientes, Mexico (Cap Corientes); Deigo Ramierz Islands, Cape Horn, Chile (Ilot de Diego Ramierez); and Valparaiso, Chile (Sude de Valparaiso, La Pointe Quraumilla). Vancouver and his officers drew these views while traveling northwards to begin their epic 1791-1794 explorations of the Pacific Northwest. This view sheet features some of the earliest nautical shore profiles of the western American coastline ever published. This particular example of Vancouver's view sheet was issued as plate no. 16 in the highly desirable 1799 French edition of Vancouver's Atlas. The rare and coveted French edition of Vancouver's Atlas is more beautifully produced with better engraving, higher quality paper, and more detail then the 1798 english edition. Rumsey 3354.013 (English edition). Streeter, T. W., The celebrated collection of Americana formed by the late Thomas Winthrop Streeter, 3498. Sabin, J., A dictionary of books relating to America: from its discovery to the present time, 98443. Cowan, R. E., A bibliography of the history of California, 1510 -1930, 1933. Wagner, H. R., The Cartography of the Northwest Coast of America To the Year 1800, 853-860.